AHHHHHH!!! It’s been a crazy, hectic and all around nutzo day! 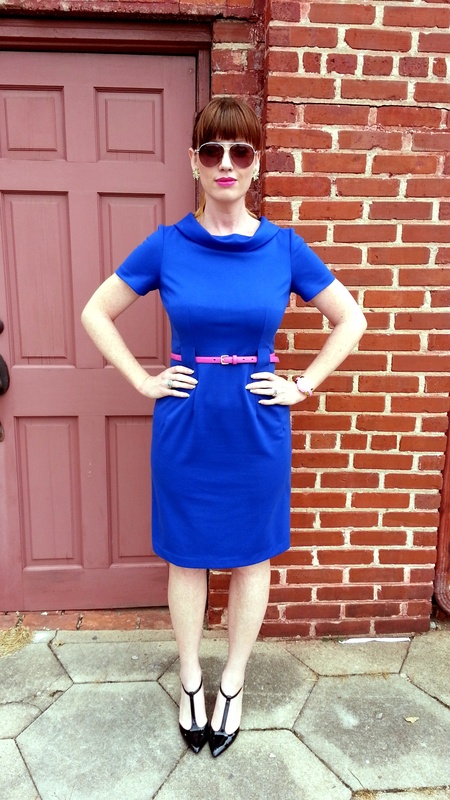 I did snap a couple of pics today though as I thought I’d share my Kate Middleton inspired, royal blue dress. A friend of mine (shout out to you Sara!) cleaned out her well stocked closet and gave me several wonderful items. Among many other cute pieces, I was excited to find this pretty blue dress. When I put it on I immediately thought of the Duchess of Cambridge due to its royal blue hue and simplistic yet chic cut. The original belt was missing so I added a belt of my own and decided on a contrasting color to give it a little Cortneybre twist! I also tried to keep the jewelry simple. Kate isn’t running around with fabulous tiaras and statement necklaces on everyday (although I would if I were her!) so I tried to keep the look simple and understated. The color was so eyecatching that no big jewelry was needed. « Stripes and Floral Prints…. Oh my gosh this shade of blue is amazing! I love that you added pink accents in your lip color and belt. Very Kate Middleton-esque! You are seriously the cutest and can pull of ANY shape and style, love love this dress! What a great friend to have! Lovely outfit: Love the length and collar. Blue suits you very well…. i love the belt which Pops the Outfit in a sweet way. So stunning outfit. You look very beautiful on blue dress. Loving the royal blue theme! !